Corresponding with the West, the element of Water, and the planet Venus: Rose Quartz is associated with the heart, love, peace, romance, intimacy, and beauty as well as bond strengthening, protection from fears and nightmares, stress reduction, and fertility. 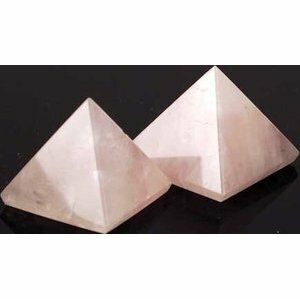 Combining the sacred geometry of pyramid power with the loving and healing energy of Rose Quartz these carved crystals have a square base approximately 1 and 1/4 inches to 1 and 1/2 inches across. A fantastic size for inclusion on an altar, within scared space, or placement in a crystal grid.